A companion to our cloud strategy think piece, this infographic shows the ways companies are using the cloud to create business value, and how they are quantifying that success. Our research shows that cloud is increasingly critical to innovation and expansion strategy, but metrics measuring those results may be in short supply. Click below to see the full infographic. Don’t miss the first of four think pieces created for our Path to Value in the Cloud program. This short paper details the way businesses are leveraging cloud in their strategic initiatives, rather than just using cloud as a driver of cost savings and process improvements. This interactive infographic details some top-level findings from our survey of 350 business and technology executives across the US. 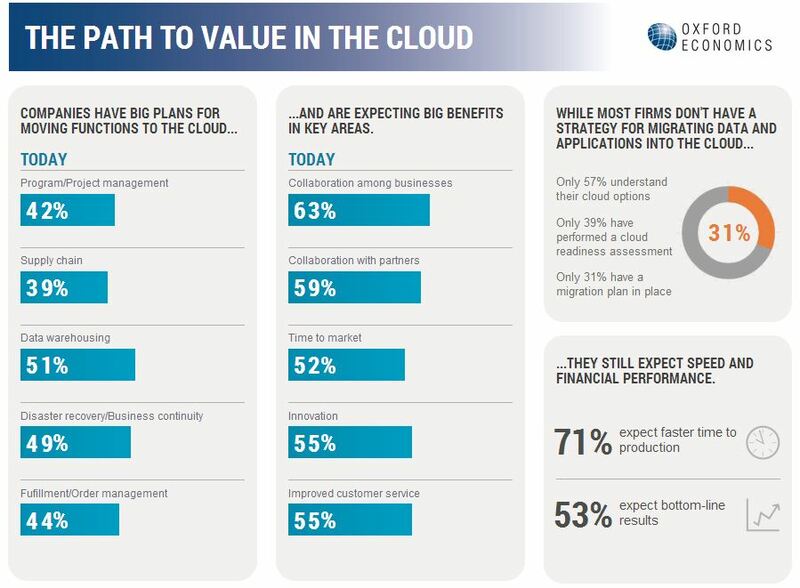 Click through to see what companies expect to gain from their cloud migrations, what functions they’re moving to the cloud, and how far along companies are on the path to value. We’ve now released all the components of the results from our survey of 350 business and technology executives nationwide. There’s a lot out there and many valuable insights for companies pursuing their own cloud migrations. Over the next few posts, we’ll be reviewing our output and findings from the study. This briefing paper outlines the main findings from the survey. Our survey revealed that while cloud is fundamentally changing the nature of business processes and collaboration, companies lack migration strategies and lack metrics to measure their own success in the cloud or the effectiveness of their cloud vendors. What makes a cloud Trailblazer? A small group of our survey respondents are farther ahead on the path to value. We know them as Trailblazers, and there are some interesting things they have in common, as seen in the infographic above. Trailblazers are significantly more likely than the rest of the respondents to have already moved applications into the cloud. Strategy is important to Trailblazers; they are far more likely to say that cloud is critical to their strategic visions and they have strategies for migrating to the cloud. Most importantly, we found that Trailblazers have higher profits and expect higher revenue growth over the next two years. For more on Trailblazers, read our think piece on the topic. For an overview of the survey results, check out our white paper. This week we’re rolling out our final think piece which focuses on the habits and practices of those farthest ahead on the path to value—Trailblazers, as we call them. Trailblazers, who make up 14% of our survey respondents, have significantly higher profit margins and revenues than the rest of the respondents. Trailblazers have a strategic, forward-thinking approach when it comes to cloud migration. They are significantly more likely to have a migration plan in place (58% vs. 26% of the total), and they leave decision making to a centralized group or committee at the regional or local level. They’re also far more concerned about data security in the cloud; to that end, they are significantly more likely to have SLAs in place and conduct internal audits of cloud services. The path to value can be a tricky one, but following in the footsteps of Trailblazers is a good starting point for cloud migrations. Click here for the Trailblazer think piece.